In what may have seemed like an improbable match up for the All A 14th Regional final when the the season started, came to realization Friday night when the Bobcats of Breathitt County met up with the Hazard Bulldogs. The Bobcats clawed their way to the finals and a date with Hazard by way of beating Owsley (17-1), Cordia (25-0), and an eye opening upset of Knott County Central (11-6). The Bulldogs were playing for their 13th consecutive and 14th over all 14th Region All A title. Hazard made their way to the championship game by winning games in convincing fashion against Wolfe County (16-0) and Leslie County (21-5). The game started off with Hazard exploding for 5 runs in the bottom of the first. The Bobcats were unable to reach base in the first half of the inning after three consecutive ground outs were recorded by Bulldog pitcher Jarrett Napier. Napier finished the night with 4 and 1/3 innings, giving up only 1 run on 6 hits, 2 walks, and 1 strikeout. The big inning for the Dogs started with a walk by Hazard lead off batter Kyle Johnson, followed by a single up the middle by Andy Baker, and then a beautiful bunt single by Trajon Campbell to load the bases. Next Dalton Baker drew a walk to score Johnson and Bailey Blair was hit by a pitch scoring Baker. James Shoptaw came to the plate and continued the offensive push with another bunt single that scored Campbell. The Bulldogs scored their fourth and fifth run of the inning with a clean single to right field off the bat of Garrett Miller. The second inning started off with a bang for the Bobcats when after going down 0-2, Lane Weddle took the Napier offering deep and over the right field fence for a solo home run to get Breathitt on the board. The Bobcats were able to get runners on 1st and 2nd by way of a Hazard error and an Isaac Bellamy single, but the Bulldogs were able to escape any further damage and ended the inning. The bats were relatively quiet for the next few innings as neither team was a threat to score until the top of the fifth. JT O’ Hair started the fifth off with a beautiful drag bunt single down the third base line. Cameron Stacy then drew a walk. Hazard second baseman, and 8th grader Max Johnson, then made a diving catch and to get the fielder’s choice out at 1st and save a run by keeping the ball in the infield. Hazard then brought in Blair who helped the Bulldogs escape the inning by getting a double play. Hazard scored a pair of runs in the bottom of the inning after Campbell walked, Dalton Baker was HBP, Blair and Shoptaw were walked scoring one run. The final RBI of the inning went to Miller, who scored courtesy runner for D. Baker, Hank Pelfrey. The final run of the game came off an A. Baker double in the bottom of the 6th that scored Andrew Ford to set the final score at 8-1. 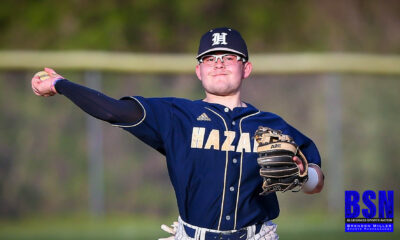 Jarrett Napier got the win for Hazard. 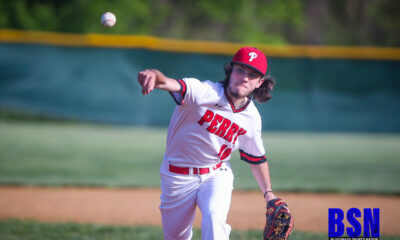 Blair got the save by going 2 and 2/3 innings giving up only 2 hits while striking out 3 and walking only 1. Offensively the Bulldogs were led in hits by Andy Baker with 3 (1 double and 2 singles) and RBIs by Garrett Miller and James Shoptaw who both had 2. The Dogs collected 9 hits and 5 walks. The Bobcats were able to rack up 8 hits of their own with 3 walks. Weddle was the only Bobcat that was able to cross the plate against the Bulldog defense on his home run in the top of the second inning. The Bobcats were led in hits by Weddle (HR and a double) and Andrew Combs (1 double and 1 single) who had two each. Moving forward, Breathitt County will definitely be in the mix during post season play. 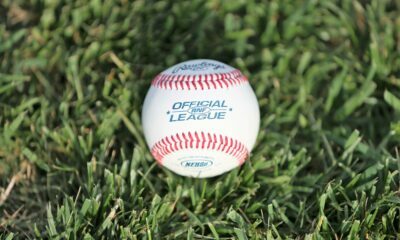 By the Bobcats showing the ability to pull the upset and win a big game, they will make for some interesting match ups when the regular 14th Region Tournament starts in May at Letcher County Central. 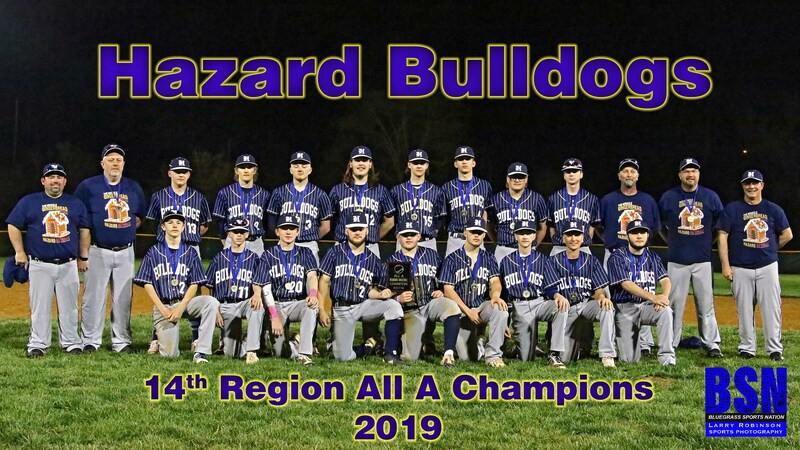 The Bulldogs will play the Williamsburg Yellowjackets, winner of the 13th Region All A, in the semi-state match up next week to decide who will play in the All A State Tournament in Owensboro in early May. Stayed tuned to Bluegrass Sports Nation for updates and game times. Thanks to our sponsor Appalachian Regional Health Care for continued coverage of our local 14th Region Baseball teams!